Two pack of 1 1/4 pound Live Maine Lobsters! Home > 12 Packs Of Lobsters! > Land O' Lakes Butter > Fresh Lobsters! > Live Lobster 2 Packs! > Two pack of 1 1/4 pound Live Maine Lobsters! Our Two packs of 1 1/4 pound live maine lobsters make for a Great Dinner for just the Two of You, or a Great Gift If You Want To Splurg! 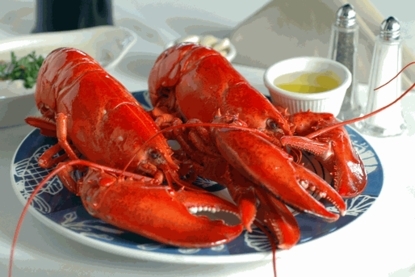 Have The Finest Live Maine Lobsters Shipped Fresh Overnight Right To Your Door! Nothing Beats Our Sweet Succulent Tasting Lobsters, Except Maybe Two of Them! YUM! we had our fresh, live lobsters from you all last night and they were the BEST!! your cooking(steaming) directions were spot on. Thanks! We will order again real soon!